Liverpool's hopes of making the Champions League knockout stages were dented as they succumbed to a 1-0 Group B defeat at Basel. Raheem Sterling and Mario Balotelli had goals ruled out for offside, but Liverpool rarely threatened. Instead, the visitors' defensive problems were exposed as Martin Skrtel headed towards his own goal and Marco Streller swept home the loose ball. Steven Gerrard came close to a late leveller when his free-kick was saved. While Liverpool roused themselves to apply concerted pressure in the final five minutes, it was not enough to merit an equaliser that would have denied the hosts victory. Manager Brendan Rodgers returns to Merseyside with more concerns over the disjointed attack and dysfunctional defence that have undermined the start of their Premier League campaign. Basel themselves looked vulnerable when they were beaten 5-1 by Real Madrid in their Group B opener, and they were cut open inside five minutes by the Reds. However, Sterling strayed carelessly offside before turning in Lazar Markovic's cross, and Liverpool struggled to create a chance of similar quality for the rest of the match. Instead full-backs Jose Enrique, preferred at left-back to Alberto Moreno, and Javi Manquillo were frequently exposed as their team were penned back. Geoffroy Serey Die, exploiting space on Enrique's flank, came closest to scoring in the first half, slamming a shot into goalkeeper Simon Mignolet's shins. "We'll see what Brendan Rodgers is made of now. They're 14th and nine points away from Chelsea. "The fans have got to be more realistic. Brendan has to stick to his philosophy and keep believing. "Mario Balotelli is an individual. The way Suarez and Sterling and Sturridge integrated, it was beautiful. "Balotelli is a bit of a fixed mannequin and he has to learn the Liverpool way or he'll just be standing there watching." While Liverpool looked vulnerable out wide in the first half, it was their deficiencies in the centre of defence that were exposed by the Swiss side's goal. Skrtel, more concerned with grappling with his man, inadvertently headed the ball against Dejan Lovren and, while Mignolet got down sharply to prevent an own goal, the goalkeeper succeeded only in palming the ball into Streller's path for a simple finish. Without the injured Daniel Sturridge and the departed Luis Suarez, Liverpool were stripped of the interplay and invention of last season and struggled for a response. Only Mario Balotelli's long-range free-kick, blocked by goalkeeper Tomas Vaclík's shoulder, and Sterling's clumsy mis-control when clean through gave the home crowd cause for concern. With back-to-back meetings against holders Real Madrid to follow in Group B, Liverpool will need a vast improvement to progress to the knockout stages. Match ends, FC Basel 1, Liverpool 0. Second Half ends, FC Basel 1, Liverpool 0. Substitution, FC Basel. Luca Zuffi replaces Ahmed Hamoudi. Foul by Marek Suchy (FC Basel). Mario Balotelli (Liverpool) wins a free kick in the defensive half. Hand ball by Rickie Lambert (Liverpool). Offside, Liverpool. Steven Gerrard tries a through ball, but Mario Balotelli is caught offside. Attempt saved. Steven Gerrard (Liverpool) right footed shot from outside the box is saved in the top right corner. Delay in match Fabian Frei (FC Basel) because of an injury. 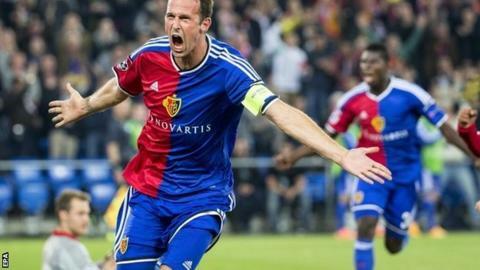 Foul by Fabian Frei (FC Basel). Mario Balotelli (Liverpool) wins a free kick in the attacking half. Substitution, FC Basel. Davide Callà replaces Breel Embolo because of an injury. Substitution, Liverpool. Rickie Lambert replaces Lazar Markovic. Attempt missed. Serey Die (FC Basel) right footed shot from outside the box misses to the right. Attempt missed. Mohamed Elneny (FC Basel) right footed shot from outside the box misses to the left. Assisted by Marco Streller. Derlis González (FC Basel) wins a free kick on the right wing. Foul by José Enrique (Liverpool). Attempt missed. Mohamed Elneny (FC Basel) right footed shot from outside the box is high and wide to the right following a set piece situation. Mohamed Elneny (FC Basel) wins a free kick on the left wing. Attempt missed. Lazar Markovic (Liverpool) right footed shot from the centre of the box misses to the right. Assisted by José Enrique with a cross. Mario Balotelli (Liverpool) is shown the yellow card. Substitution, Liverpool. Adam Lallana replaces Philippe Coutinho. Offside, Liverpool. Lazar Markovic tries a through ball, but Philippe Coutinho is caught offside. Corner, Liverpool. Conceded by Taulant Xhaka. Attempt blocked. Raheem Sterling (Liverpool) right footed shot from the centre of the box is blocked. Assisted by Philippe Coutinho. Serey Die (FC Basel) wins a free kick in the attacking half. Offside, FC Basel. Ahmed Hamoudi tries a through ball, but Marco Streller is caught offside. Attempt missed. Mario Balotelli (Liverpool) right footed shot from outside the box is too high. Assisted by Lazar Markovic. Corner, Liverpool. Conceded by Tomás Vaclik. Attempt blocked. Lazar Markovic (Liverpool) right footed shot from the centre of the box is blocked. Attempt saved. Mario Balotelli (Liverpool) right footed shot from outside the box is saved in the centre of the goal. Marek Suchy (FC Basel) is shown the yellow card for a bad foul. Lazar Markovic (Liverpool) wins a free kick in the attacking half. Attempt blocked. Jordan Henderson (Liverpool) right footed shot from the centre of the box is blocked. Gerrard answers critics, but for how long? Read more on Gerrard answers critics, but for how long?